With U.S. Attorney Preet Bharara investigating various legislators, it doesn’t seem like a great time for Albany lawmakers to ask for a raise. While they haven’t had a pay increase in 15 years, at $79,500, their base salary is the third highest among state legislators nationwide. Nevertheless, lawmakers are trying to hold a vote by the end of the year to increase their salary before the new session. 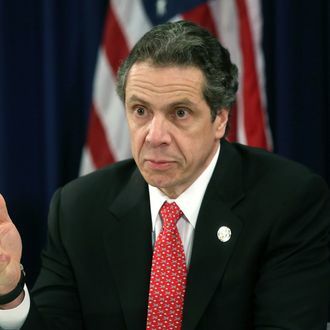 The move would have to be approved by Governor Cuomo, and they’re considerably less enthusiastic about his plan to trade a pay increase for a slew of ethics reforms. Cuomo took flak for shutting down the anti-corruption Moreland Commission last year, and it appears he’s trying to make up for it in his negotiations with lawmakers over the terms of their raise. The New York Times reports that he’s proposed many changes, including restricting their use of campaign funds, requiring lawmakers to document their expenses, broadening Freedom of Information Law disclosures, and making it easier to strip corrupt legislators of their pensions. Sources claim that the legislators are fine with many of the reforms but take issue with a proposal to limit the amount of money they can make at other jobs, as many of them earn sizable salaries from their work at law firms. They say the governor is piling on demands but doesn’t seem serious about reaching a deal. It’s almost like he doesn’t care about their salaries and just wants to look like he’s getting tough on ethics.